CanadaOnCanvas.com: New From LexJet: Satin Cloth! Satin cloth is a new material developed for the Giclee process. It has many of the advantages of canvas, and offers new possibilities for displaying your art. It can be sewn, stretched or hung like canvas, and it has even been hung outside! Satin Fabric has a very smooth texture which does not conflict with the fine detail in your image bright whites give it superior colour response. Some people describe it's look and feel as being like vellum. This product is exiting for us here are Canada on Canvas because it's translucency allows for highly creative and beautiful mounting options. Excellent. Accepts high levels of ink saturation. PreLume technology provides brighter white points. Excellent. High levels of ink saturation and bright white point. Lexjet water-resistant satin cloth is stretchable like canvas, and can be mounted for wall hanging. Other mounting options offer the possibility of taking advantage of the material's transparency. Mounting using back-lighting works very well with this material, because the smooth weave of Satin Cloth acts as a natural diffuser, making the whole image glow with light. OR by sewing a pocket into the top and bottom of the cloth, and inserting a dowel to suspend the banner from. Another mounting option is using a commercial banner displays like these, which can be back-lit, or use the ambient light in the room or outdoor area to show off the Satin Cloth's transparency. Displays like these are available here. the Lexjet blog has a great post on innovative business ideas using this material. A very beautiful and original option for displaying your Satin Cloth print is to create a light-box. 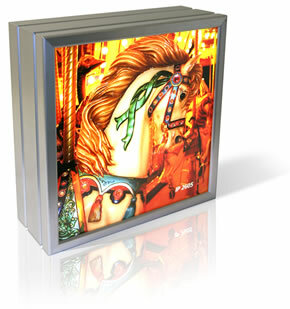 A light-box is a framed box that with light mounted inside, and a translucent image on the front. They are often used commercially and by professional artists, but Satin Cloth printing allows them to be created affordability for home decor. A Light-box turns your image into a creative ambient lighting solution, as well as highlighting the particular beauty of your image. Back-lighting increases the presence and richness of saturated colours, it lends an ethereal quality to soft or misty images, and it makes skin really glow in portraits. Finished and, ready to hang. Beautifully textured fine wall art. can be hung on wall or window for natural light back-lit effect. Original and beautiful wall are and lighting solution. Makes any photo come alive.